I contacted John about installing a serving hatch in my newly acquired horse trailer which I was looking to convert into my mobile catering unit for my Dutch mini pancake business and the result was truly beyond my expectations. The end result looks amazing and is exactly what I had envisaged it to look like. Throughout the process John was very helpful in giving me advice and providing suggestion and made the necessary adjustments to the design where we have requested these. I thoroughly enjoyed working with John and would recommend him to anybody. Guaranteed value for your money ,very professional and nice person to work with ! Great welding and fabrication service, we use Fresh fabs for all our tricky welding work. 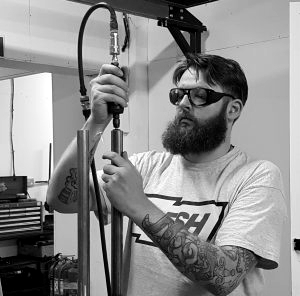 Best TIG welder we know, especially on aluminium and stainless steel. Attention to detail is first class and we can trust Jon to get the job done on time to the highest quality. Look forward to the next project. The original chimney that came with the cooker hood was way too short. It was a small job which most companies wouldn’t be interested or their cost too high. Luckily I found Fresh Fabrications. They were great. The job was well priced and they produced a nice piece for me. The texture of the new chimney matched the rest of the hood and the angle of the cut at the top was spot on. They even took time to talk me though how best to mount it. I would happily recommend them. Excellent quality repair to my alloy wheel. Very easy to deal with and gave an honest answer to questions and went through the stages of repair. Without hesitation I will be using Jon again for any welding work again. Very trust worthy and delivered the repair in a timely manor. Met with John and described what I was after. He had no problem with what I wanted and was happy to make a start. Friendly and very professional all round, and the end result was of a very high quality of work. I would have had a lot more work done here in the past had I known. Highly recommend.